Three words that could drive longevity and accomplishment in skiing. In golf there is a mythical intersection between age and score. A point at which you may arrive if both your health and your skill hold out long enough. It’s called “shooting your age” and it’s really, really hard to do. For example, I used to play quite a bit of golf. Rare was the day that I’d actually play 18 holes, but even if you combined my two best scores on 9 holes I’d have to not just shoot those scores again back-to-back, but do it when I am 77 years old. Skiing your age, on the other hand, flips the script. Instead of having to stay fit long enough to pull it off, many of us have likely accomplished it at some point in our lives. The challenge simply becomes to maintain it for as long as possible. That chart is one that Mt Hood meadows shared a while back in response to a question from one of their skiers. Here’s a skier who had been using Meadows’ online run tracking system to do this very thing and, at age 71, he was interested how many other skiers had managed to do the same. Turn out, he was the oldest skier to pull it off. This is a simple idea, right? But nestled in the fabric of the concept are three big ideas that carry skier behavior in a really intriguing direction. First, is the idea that skiing (like golf) can be a lifetime sport. Not something you do as a teenager or young adult, but something you can do for nearly as long as you live. 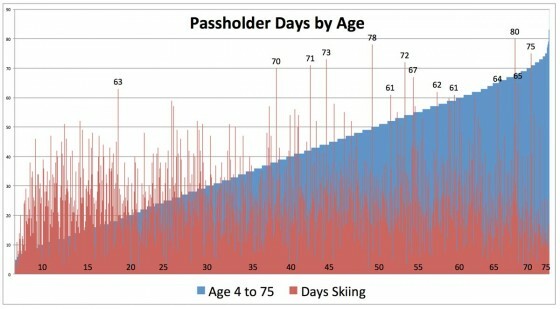 When I first met my neighbor, he framed his age in how long it had been since he had to stop skiing: 4 years. He’s 86. Second, this idea gives all skiers something to shoot for – something to accomplish – not just this year, but every year. I haven’t skied my age since high school. I come pretty dang close each year, though, and I’m already thinking about ways I can make it happen in 2017/18. Third, parents love to see their kids succeed. So while a destination skier and father of two likely won’t ski 35-40 days this year, his kids easily could with maybe just one more trip to the mountains before the snow is gone. Skiing your age is a term that is rarely, if ever, used in skiing. But it could be and, if you ask me, it should be. Like a 100 Club for the rest of us, it gives skiers something to work toward not just now but throughout a lifetime of skiing. It’s that duo – achievement and long-term thinking – that could serve this sport very, very well going forward.